National Day is coming up and I’ve been thinking up patriotic celebratory foods! Instant Pot-crazy friend A has come up with an Instant Pot party where we are supposed to bring our Instant Pots and mass cook a potluck while watching the National Day Parade on the telly. I don’t often make desserts – I confess I’m not a brilliant cake baker or dessert maker so I usually tend to follow other people’s recipes than to innovate my own. But occasionally when I feel a need to put an Asian spin on things, I do get into experimentation mode. 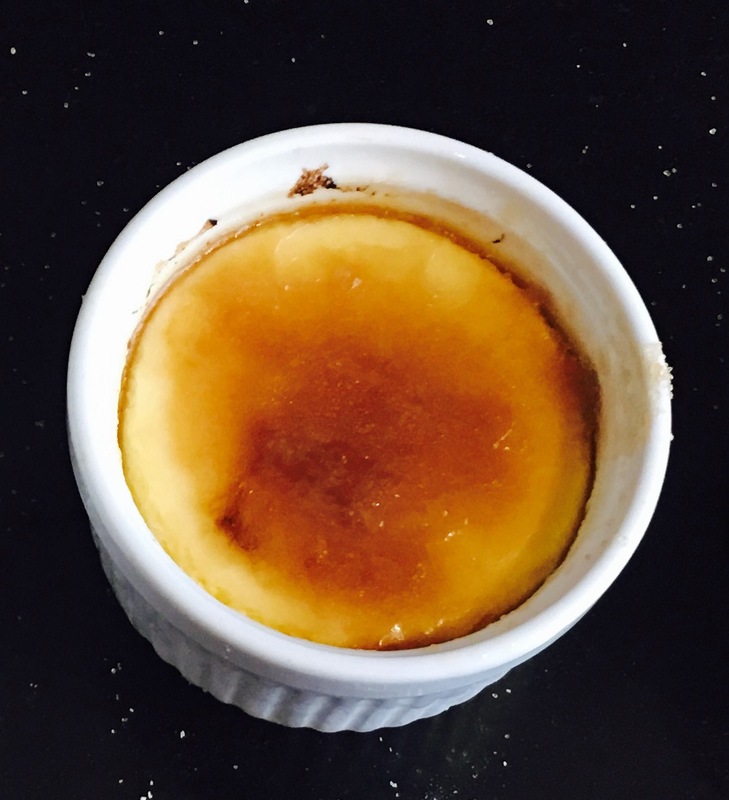 Creme brûlée is the easiest dessert to make. Seriously easy. In fact it is one of those basic recipes one would dig into when entertaining and wanting to impress but with minimal effort. In fact I think the only tricky bit is to get it into the oven with a water bath which is why I started thinking about doing it in the Instant Pot. My first experiment was a clear disaster – all the little ramekins’ contents exploded outwards like a bad slime experiment. But that was entirely my fault because I was trying to work on a document and forgot about releasing the Instant Pot at the right time. My bad. But I went back to the basics again and the experiment worked pretty well this time. The pandan extract and coconut milk gave a South-East Asian type of flavour to this yummy dessert. But when I yanked the ramekins out of the Instant Pot I had a moment of pause. I wasn’t quite sure if sweeteners would caramelize well, which is why this cook became an experiment. So the powdered Swerve actually didn’t really brown very much with the blowtorch. It turned a delicate sheen of beige after a while and made a little thin crust. The flavour was quite nice but with the usual cooling taste on the tongue. The Splenda behaved frighteningly with the high heat of the blow torch, turning into little intense black dots almost instantaneously. I must have broken down some chemical bonds there. Monkfruit was lovely, with a nice caramelization and solidifying with cooking into a nice crust. And the sugar one of course was my control ramekin – as seen in the picture below. From left: powdered erythritol (Swerve), Splenda, monk fruit extract and regular sugar. So the verdict? A successful experiment. My personal preference is for monkfruit extract as the sweetener of choice to make the brûlée layer. But it’s not terribly accessible here in Singapore (I picked up a bag from Whole Foods the last time I was in the US). Still erythritol is probably a good second option and is easier to find. With a hand mixer, mix the egg yolks and sugar substitute together, then add the coconut milk, whipping cream and pandan extract and beat further till well incorporated. Pour the mixture through a fine sieve into a pouring jug. Pour the mixture equally into 4 ramekins. Cover each ramekin tightly with aluminum foil. Put 1 cup of water into the Instant Pot and place a trivet in the pot. Carefully place each ramekin on the trivet. Close the lid of pot and put the valve into the sealed position. Use manual high pressure for 6 minutes, then do natural pressure release for 9 minutes. Open the pot and put the ramekins on a cooling rack. Remove the aluminum foil pieces. When cook, cover each ramekin with clingwrap and put in the refrigerator for at least 2 hours. When ready to serve, sprinkle 1 tsp of chosen sweetener on top and torch till bubbling and slightly browned. Allow the top crust to cool; the sweetener will actually solidify after a minute or two. 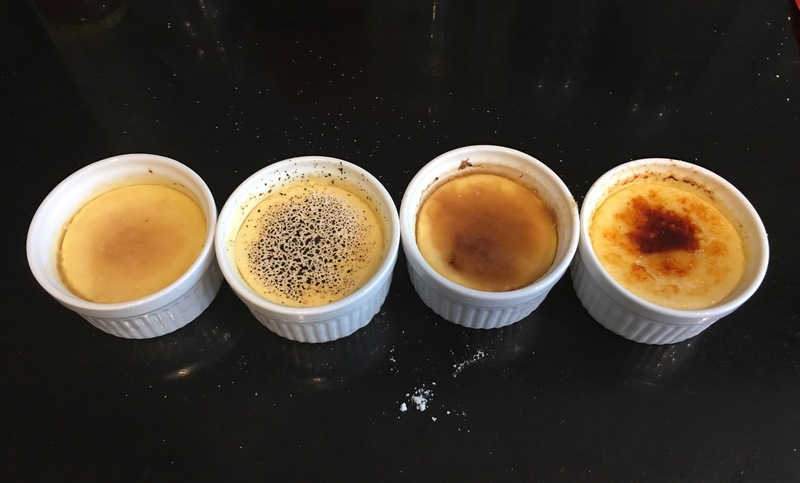 Serve immediately for the lovely mixture of cold creme brûlée with a toasty hot sweetened topping. 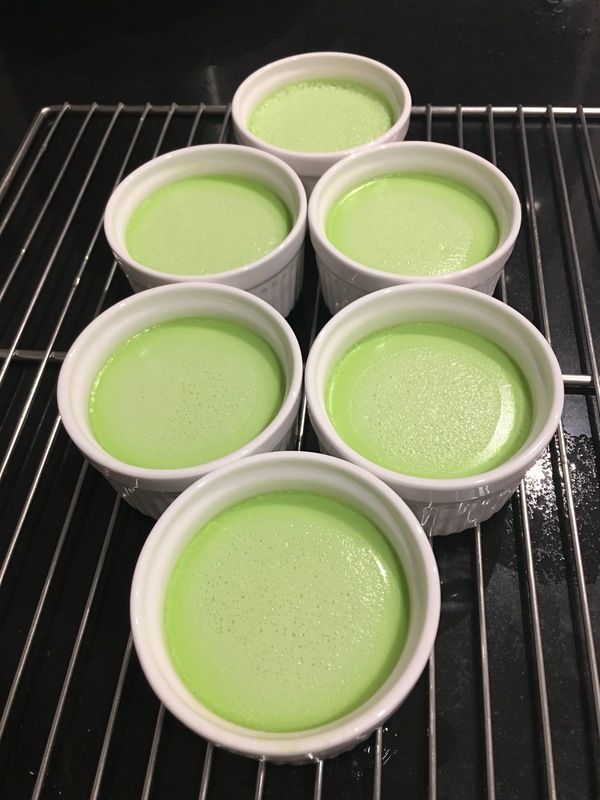 Note: second round tweak of the recipe – I added 1/4 tsp of pandan paste to the recipe for colour. This is slightly different from the pandan extract I used in the original recipe. It gave a lovely green colour (or at least, lovely to us Asians because I’ve seen friends from the U.K. recoil at our green pandan cakes). 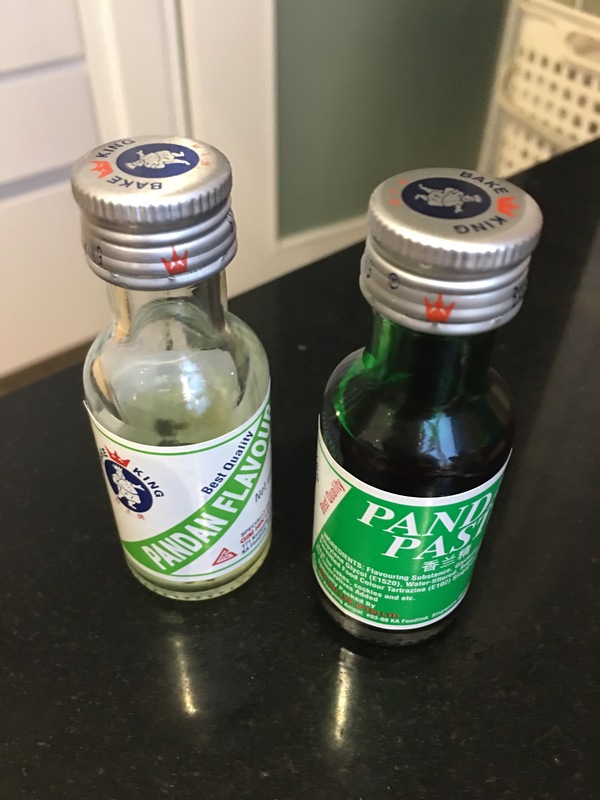 The pandan paste is also available in most local supermarkets and bake shops. Secondly, after doing this recipe a couple of times and having had a couple of kaya-like explosions, I’ve discovered the key is not to overheat the eggs and cream mixture – I think the little air bubbles expand dramatically under pressure. I finally managed to get a perfect sheen after this tweak.